Heheh! awesome so we have Thaeus from MK in panel 1 (the spatula rat) and Donnie's character Hanse in Panels 2 and 3! Hahah, its pretty awesome how you cameoed Thaeus! Also.. that means Greatlansd isn't totally populated by foxes.. interesting! Looking at Hanse, I have a feeling the war wont go down well with the general populace of Greatland. * (Kai|MentosKitty) is Fresh and Full of life! Tvorsk: Kitty - The Mewmaker. For the glory of the sammich! Hmm. 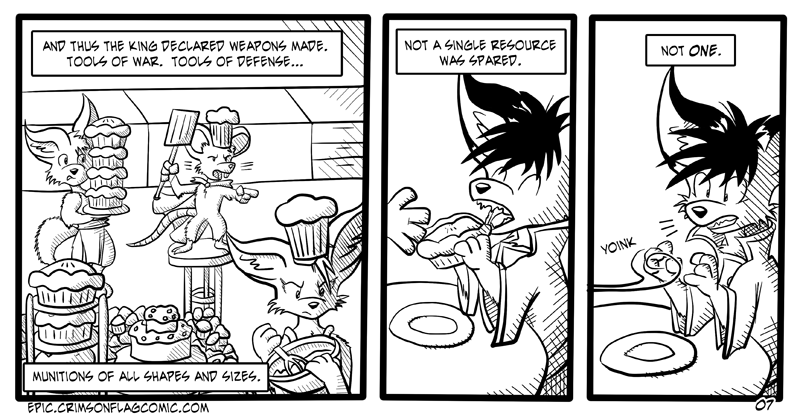 And the problems of food-based weaponry arrive! too bad for Hanse, tho- got his pie taken away, but at least it was with a proper cartoony yoink! When was the last time you hugged your sammich? Nyahaha, naw he'll take it kindly... he'll just track that one pie that was stolen from him, ignoring all others, and steal it back or eat it on sight.... failing that he'll eat pies . haha! you know.... That could lead to an AWESOME side Comic idea that you could draw! The story of Hanse tracking down his Pie! * KaiAdin pokes Donnie! "Dooo it!" Indeed, and you could use it as a warm-up of sort before going into the full-blown OL comic... WHICH I WANT TO SEE TOO, BLAST IT! * Tvorsk chants, "Donnie! Donnie! Donnie!"